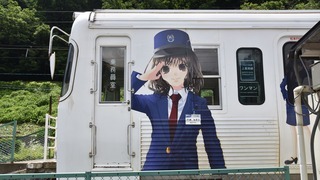 So, what’s with it with Shirobako and trains, anyhow? Train references keep cropping up at the most unusual times. If they had brand names, I’d say it was product placement, but these don’t. It’s as if director Mizushima wants to create a drinking game or something, or maybe because he thought it up while riding on a train. It starts in Episode 1, where the first shot you get after the beginning of Exodus, the anime-within-the-anime, is of a train, possibly a track maintenance train, pulling into a station. It’s not mentioned in any way, and the next shots are of the various Musashino Animation people with Exodus playing in the background. Just doing a little track maintenance. She tells her that the only diesel train running on the line is a track maintenance train. If it was a reference to the train in Episode 1, then that was the only shot of what was going on in Exodus. Next, Miyamori Aoi heads to Sawara Studio to deliver a musical instrument, and gets roped into providing all sorts of sound effects. The sound editor mixes in a train sound to Miyamori’s gaaow give it a little ballast, or something. …or maybe somebody’s daughter, it’s a fun and unexpected aspect of my favorite anime. This entry was posted on June 12, 2016 at Sun, 12 Jun 2016 11:40:31 -0700 and is filed under Anime. You can follow any responses to this entry through the RSS 2.0 feed. You can leave a response, or trackback from your own site.